Heading to the French-inspired Church & State Bistro downtown to dine with some old and dear friends, I thought it would be a perfect opportunity to compose a guest review for my favorite new blog: We Heart Mac & Cheese. So after ordering and consuming a fine array of choices including the herring and fingerling potato salad, the fig and arugula tart, the short rib with morels and a hearty green salad - we finished up our main courses with a side of Macaroni and Cheese Gratin, $6. Now, I Googled the word "gratin" so I could confirm my thoughts about the technical definition - this from Wikipedia: Gratin is a widely-used culinary technique in food preparation in which an ingredient is topped with a browned crust, often using breadcrumbs, grated cheese, egg and/or butter. Gratin originated in French cuisine and is usually prepared in a shallow dish of some kind. A gratin is baked or broiled to form a golden crust on top and is traditionally served in its baking dish. So - Shallow dish? Check. Cheese and/or butter? Check. But, as you'll see in the image to your left, there is no discernable gratin of the above definition visible. This mac & cheese was definitely not topped with a browned crust, which might have sent it into the realm of stunning, but despite the lack of a crispy topping, I can't deny the fine cheese quality (my best guess is gruyere and a sharp cheddar), flavor and consistency of the dish. This is not your soupy mac & cheese, which Ms. Havarti and I so disdain - no, this cheese mixture clung to the firm elbow noodles as if its very life, and my mac & cheese enjoyment, depended on it. Creamy texture, rich (but not too rich) and most importantly a full on cheese flavor. 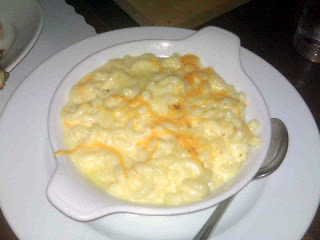 So to sum up, even though I prefer my mac a bit more on the baked side, due to the fact that the atmosphere of the restaurant is fantastic, the food is delicious, the portions huge, and the cocktails tasty - I would review this as "destination" mac and cheese. As in get yourself down to Church and State stat! I like the concept of your blog. Focusing on Mac 'n cheese is unique. And it's really interesting to see varieties of them on your blog. I just wrote about them on my blog too. If you have time, please take a look.